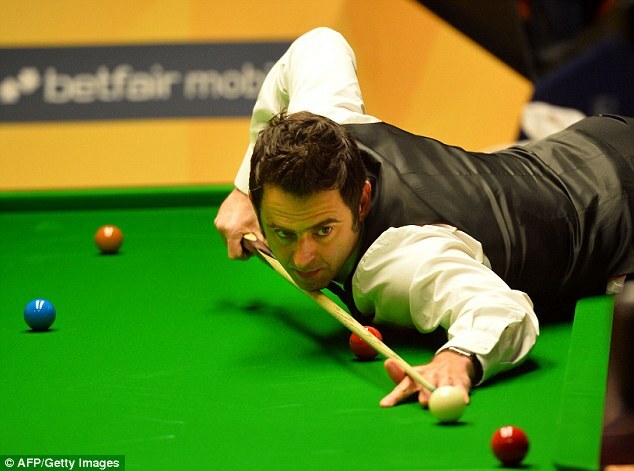 Ronnie O’Sullivan has vowed to return to the Crucible in 2014 in an attempt to win his third World Championship crown in a row. The five-time winner of snooker’s most prestigious event has outlined his schedule for up to next April, and it also includes to UK Championship and the Masters. The 37-year-old is back in action at the Bluebell Wood Open in Doncaster this week as he bids to return to the world’s top 16. O’Sullivan said: ‘This season I am playing this weekend at the European Tour event sponsored by the Bluebell Wood Children’s Hospice. ‘Then you are looking at one or more European Tour events in Germany, the Champion of Champions, the UK, the Masters, German Masters in Berlin, Welsh Open and the World Championships. ‘I have the ten events that I have to play for my sponsor going from last year’s world championship, that would make at least the ten and there might even be a couple more. He is due to play 15-year-old Lu Haotian on Friday, and a potential last-16 match against world No 1 Neil Robertson. Talking about the last few months, O’Sullivan said: ‘To be honest I probably should have entered September’s Shanghai Masters and wish I had, I didn’t and I regret that as it is a good tournament and I like the city.